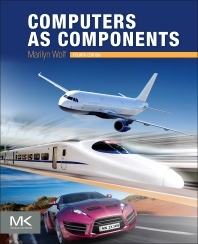 Computers as Components: Principles of Embedded Computing System Design, Fourth Edition, continues to focus on foundational content in embedded systems technology and design while introducing new content on security and safety, the design of Internet-of-Things devices and systems, and wireless communications standards like Bluetooth® and ZigBee®. Students in an embedded systems design course as well as researchers and savvy professionals schooled in hardware or software design. Marilyn Wolf is Farmer Distinguished Chair and Georgia Research Alliance Eminent Scholar at the Georgia Institute of Technology. She received her BS, MS, and PhD in electrical engineering from Stanford University in 1980, 1981, and 1984, respectively. She was with AT&T Bell Laboratories from 1984 to 1989. She was on the faculty of Princeton University from 1989 to 2007. Her research interests included embedded computing, embedded video and computer vision, and VLSI systems. She has received the ASEE Terman Award and IEEE Circuits and Systems Society Education Award. She is a Fellow of the IEEE and ACM and an IEEE Computer Society Golden Core member.. She is the author of two successful Morgan Kaufmann textbooks on embedded systems: Computers as Components, Third Edition (2012; 4e under contract); and High-Performance Embedded Computing, Second Edition (2014).